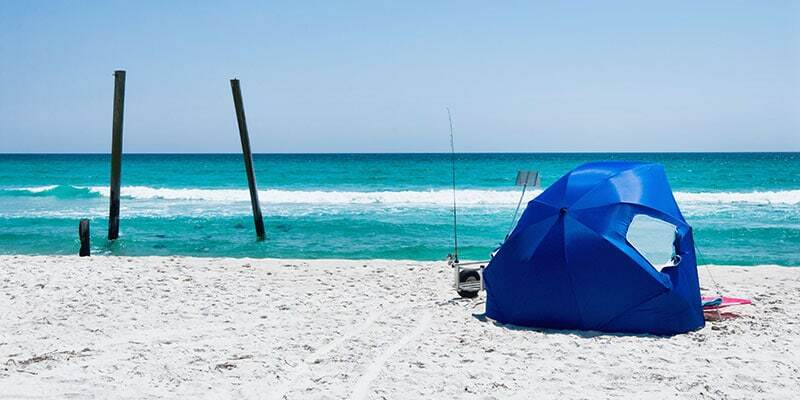 You are here: Home / Beach Things / What Is The Best Beach Tent For Your Sun Canopy Needs? What Is The Best Beach Tent For Your Sun Canopy Needs? Going to the beach is definitely one of my favorite things about summer, but getting a sunburn can really ruin that. Plus, sometimes you just need a break from that sweltering heat. Growing up, my parents just had one of those portable beach umbrellas that you stake in the sand to keep the sun at bay. But let’s face it, those aren’t really the best option that you have. All it takes it a strong wind and that thing blows right over. That’s why I prefer to use a beach tent or sun canopy for my family’s sun shelter needs at the beach. If you’ve been looking for a good option for your family, then check out the sun shelters below to keep everyone in the shade this summer. The best type for you really depends on your needs and the number of people that you expect to seek refuge from the sun’s rays. 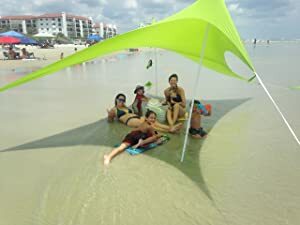 For a large family or for people who want to set up a lot of beach gear in the shade, a cabana-style sun canopy is likely the best option. For the single person or couple who really doesn’t need 100% full coverage, the umbrella-style sun shelter is a great option. 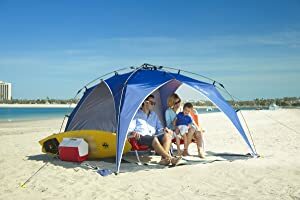 If you need more space for the family or want something like a beach tent for babies who will spend most of the day on the shore with you, the tent-style sun canopy is the best option. If you want a good beach tent that will fit the whole family, then take a look at the Pacific Breeze EasyUp Beach Tent Deluxe XL model. The size of this one makes it pretty easy to fit a family of four all at the same time. This thing is very easy to put up and getting it setup on the beach is also a quick process. 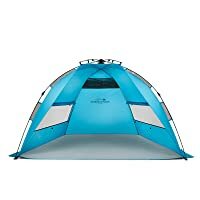 I also think that it is one of the best best tents for wind because it comes with stakes as well as having 5 sand pockets to really weigh it down against any strong gusts of wind. It is very compact and lightweight at just 6 lbs, which makes it easy to transport to and from the shore. The sun protection rating for this one is UPF 50+ and the polyester material is water repellant! Also note that it has three large window vents so that you don’t roast while sitting in it. Traveling to the beach with lots of little ones? Then you will absolutely love this large beach shade tent. 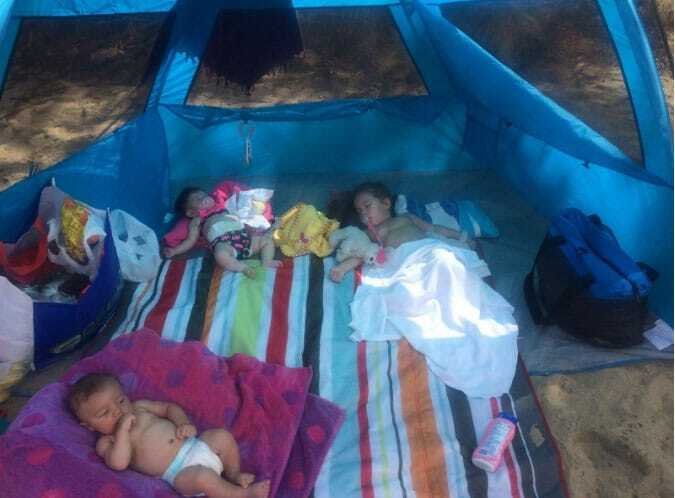 In fact, we think that it is the best beach tent for babies thanks to all the space that it offers for the little ones. Maybe you’re having the whole family get together at the beach, or maybe you just are taking a lot of chairs, coolers and other gear that requires a lot of space. That’s where a good beach cabana for the family makes a great choice. You get more than that a tent offers, and best of all, since cabanas are tall you can actually stand up while under one of them! Our favorite option for a top rated beach cabana is the EasyGo Beach Cabana model. 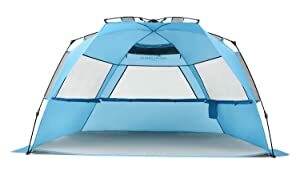 This thing super strong and wind resistant, which means that you can count on it to stay up all day long while you listen to the sound of the waves hitting the shore. And it is one of the most lightweight beach cabanas that we’ve seen at just 8.5 lbs! Just sling it over your shoulder and you can carry it right down to your favorite place in the sand. One of the best things about it is how quick and easy it is to setup – we’re talking less than five minutes to get your shade from the sun all setup and ready for relaxing with views of the ocean. Check out the image below to see those easy setup steps. You can comfortably fit four adults under this thing with no problem, which also makes it great for families with kids and babies. 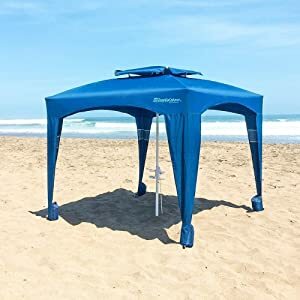 So, if this is the style of shelter that you’ve been looking for, we highly recommend this particular model for your sun canopy needs by the sea. Regular beach umbrellas simply cannot stay put with the winds coming in off the ocean, which is why you need one with sand anchors if you prefer the umbrella style. With that in mind, the best option for you is the Otentik Beach SunShade – With Sandbag Anchors model. Sure, it doesn’t have that traditional umbrella design, but it is definitely more sturdy against the wind. The sandbag anchors are what really makes this one of our top rated sun shelter picks. This thing comes in two different sizes, with a larger option being perfect for a small family. Setup is quick and easy. And all you have to do to secure it in place is to fill those sandbag anchors. It is very compact when not in use, at about the size of a beach towel. And it only weighs around 6 lbs, which makes it easy to transport to and from the seaside. So, if you want the perfect hybrid of the cabana and the tent, then you need to look at beach canopies for sun shelter. A favorite here is the top rated Lightspeed Outdoors Quick Beach Canopy Tent model. 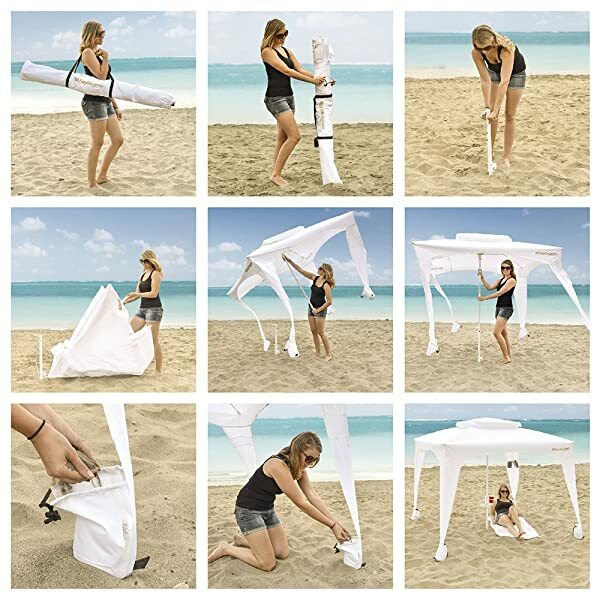 It is the perfect pop-up sun shelter for a fun day at the beach with friends and family. You can comfortably fit a family of four in this thing. It is compact and lightweight for transport, and setup is quick and easy because it uses an umbrella-style system. It is also very secure against wind gusts because it has four sand pockets for extra anchoring! Keep in mind that all of the above sun shelters can be used for camping, sports and other activities in addition to a day by the sea.